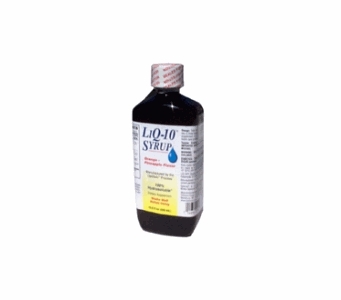 LiQ-10™ Syrup is the ONLY 50 mg Hydrosoluble LIQUID CoQ10 supplement in the world and the ONLY 50 mg LIQUID CoQ10 supplement for oral use that exhibits 100% dissolution. Now, our CoQ10 is available in a 50mg, (per 5 mL), liquid form for those individuals who are unable to swallow a softgel. Bottle size: 16.9 fl oz (500 ml) holding one hundred 50mg doses. Liquid Q LiQsorb Liposomal CoQ10 Drops (30ml) Enhanced Absorption. *Daily Values based on 2,000 calorie diet. Directions: Take one (1) teaspoonful (5ml) one to three times daily, as a Coenzyme Q10 supplement or as recommended by your health care professional. If you are pregnant or nursing a baby, seek the advice of a health professional before using this product. Keep bottle tightly closed. Store in a cool, dry place at controlled room temperature 15°C-30°C (59°F-86°F). Do not refrigerate. Liq-10™, and Hydrosoluble™ are trademarks of Tishcon Corp.